The blade in your lawn mower is probably not something you have spent a lot of time thinking about. If you want to keep your lawn healthy, and your mower running smoothly, there are a few things you need to consider. Let's take a look at what it takes to keep your lawn mower blade in tip-top shape. Most people never replace or resharpen the blade in their lawn mower for as long as they own the mower. They figure since the mower still cuts grass, there is no need to replace the blade. A dull blade leaves frayed ends on the grass as it cuts. This wound needs to healed before the grass can keep on growing. The edges turn brown as the plant slowly rejects dead material. Your whole lawn looks brown and unhealthy. Only after the wounds are healed will your lawn starts to grow again. A sharp blade produces cleans cuts. The grass still needs to heal before growing again, but it takes much less effort to do so than a frayed cut requires. Your lawn can use the energy it saved by not having to heal a frayed edge into creating stronger roots, fighting off pests, resisting weeds, and all the other things your lawn has to do to stay alive. All of this adds up to a healthy lawn. If you do not care about keeping your lawn in peek condition, you can safely ignore the cutting edge of your lawn mower blade. A dull blade will still cut your lawn. It'll eventually have to be replaced due to rust issues, but a decade might come and go before that happens. Ignorance is bliss, sometimes. Thankfully lawn mower blades do not require a lot of sharpening. Depending on the size of your lawn and how many ground strikes your blade suffers, sharpening your blade once a year should be enough. If you do it regularly, it takes very little time and effort. A metal file is all you need to sharpen your blade. A die grinder, angle grinder, or bench top grinder makes the work go much faster. The good people at Lowes created this video to show you the steps involved. The only lawn mower blade issue you have to be aware of is this: An out-of-balance blade will quickly damage the drive shaft of the motor and ruin the entire mower. It is imperative that you keep the blade well balanced to ensure the maximum mower life. The balance of the blade is so important because the tips of the blade rotate at high speeds. If one side is even a little off the drive shaft starts to press against its bearings and the mower starts to rattle. After a while the bearings fail or the mower shakes itself to death. Either way, not a good outcome. Blades do not go out of balance on their own. It takes a significant amount of force to deform the blade enough to cause it to go out-of-balance. A ground strike (when the blade hits the ground) is one such event. Whenever your mower's blade hits the ground, pause for 10 seconds and listen to the hum of the blade. If the mower still sounds like a fan and there is no vibration in the mower's handle, you are fine. If there are issues, it's best to stop mowing and check the balance of the blade. You can finish cutting the lawn, if you want, but your mower will slowly take damage from the out-of-balance blade. 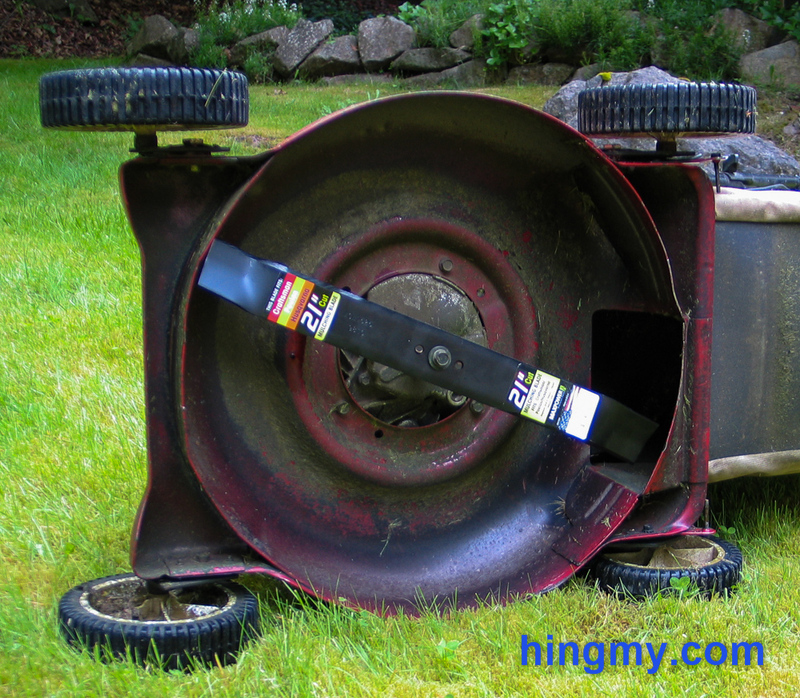 Your lawn mower blade must be kept balanced to protect the mower's motor from damage. If your mower vibrates excessively during use, or makes a rattling sound, it might be time to check the blade balance. If you want to have the healthiest lawn possible, maintain a sharp cutting edge on your blade. A sharp blade cuts the grass cleaning and gives it the best chance to stay healthy. If you just want a shorter lawn and don't mind a few brown spots, forget about sharpening. Keeping the blade balanced is the only thing your really need to worry about.